Speaking of bargains, it wouldn’t be a Cool Mom Picks Holiday Gift Guide without lots and lots of discount codes, so we’ve gathered plenty for you, all good through the end of the year. Thanks so much to the generous brands and indie shops willing to make holiday shopping a little easier for all of us this year. This year, we want to thank you for spreading the word about gift guide (hey, we’re a small business too) and celebrate so many of the small businesses we love supporting all year round. 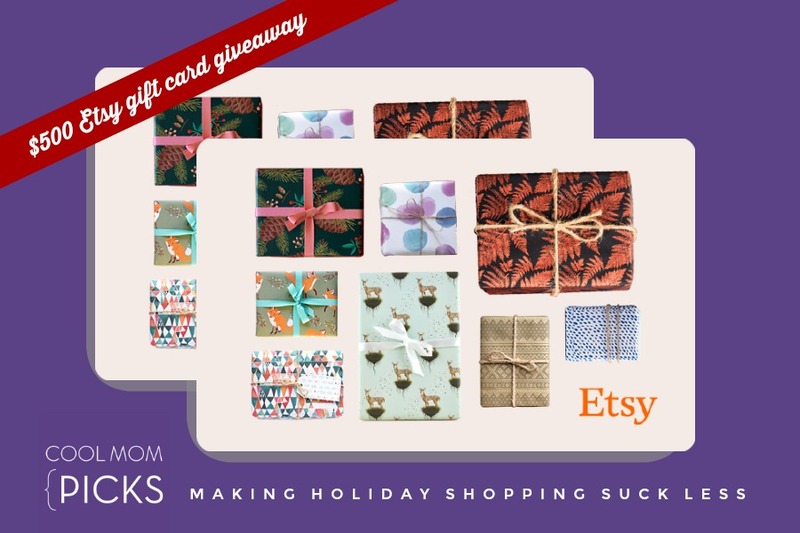 We’ve got two $250 Etsy Gift Card for two lucky winners – that’s one card each! Just think of all the handmade, indie artisan goodness you could buy for everyone on your nice list this year. Contest ends 11:59pm PST on December 31, 2017. We’ll draw 2 lucky winners at random from all the entries. You must be 18 years or older to enter, U.S. residents only. Void where prohibited. Read more detailed contest and giveaway rules here. CMP is an rstyle and Amazon affiliate. That means purchasing some items will help support our own small business with a very small percentage of sales. • There has been no compensation for the editorial picks throughout our guide — just the stuff we love. • We have several amazing sponsors (really!) who are all clearly and plainly disclosed — and they sell the kinds of gifts that are so great, we’d pick them anyway. You’ll see!